RadDataForm auto-generates its fields by default based on the properties of the source objects. They are stacked vertically in a standard form layout and depend on the type of each property. All of them are of type DataTemplate and there is no limitation on the types of controls you may place inside. Their DataContext will be the current item of the RadDataForm. Custom-defined fields may coexist with the auto-generated ones or the auto-generated may be canceled. 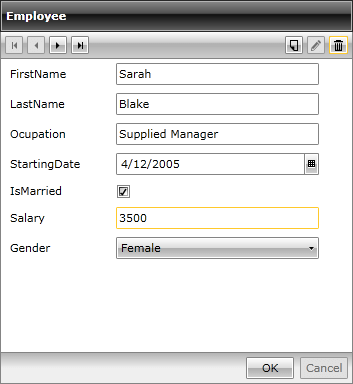 The three data templates - ReadOnlyTemplate, NewItemTemplate and EditTemplate - correspond to the relevant modes of RadDataForm. So, when the form is in read-only mode, the ReadOnlyTemplate is displayed, when in edit-mode - the EditTemplate and when a new item is added - the NewItemTemplate. For each different state, you will need to define another template. It could be with the same content or it could be with a different one. You will need to define separate templates for the read-only and edit modes.